For 15 years, the restaurant in this rustic stone building on a quiet street in Yountville was a Bay Area institution under proprietors Sally and Don Schmitt. But the couple eventually got tired of the daily grind, and in 1994 a new French Laundry was born when chef-owner Thomas Keller arrived from L.A. With Keller in the kitchen, the food soars to stratospheric heights, yet the restaurant stays true to its rural, wine-country roots. You'll encounter no big-city attitude, just impeccably prepared and artfully presented cuisine that few restaurants in the U.S. can match. Keller also has a refreshing sense of humor about his cooking, unusual in a chef operating at such rarefied culinary levels. A case in point: the fetchingly named tongue in cheek, buttery beef cheeks paired with slices of veal tongue, pencil-thin baby leeks and horseradish cream. You may find a salad of Hawaiian hearts of palm and spring onion, or Maine lobster tail with truffles and corn pudding. Dessert might be his coffee and doughnut: an espresso mousse encircled by puff pastry. 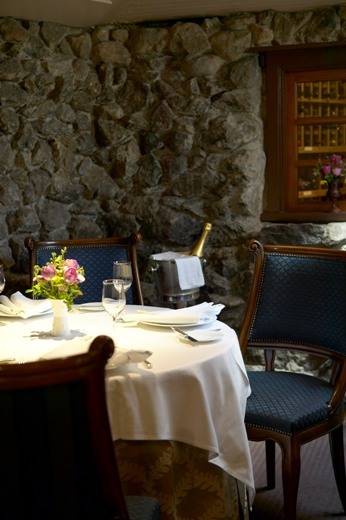 Keller's restaurant boasts smoothly professional service and an extensive wine list, with many choices available by the half bottle. Reservations are taken two months to the date prior to dining. The nine-course prix-fixe meal may take about four hours.